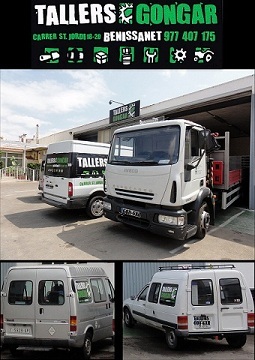 Ginés González Castro, a young entrepreneur, started his business about the year 1971 under the name Talleres Gonzalez, its main business, welding, repair and sale of agricultural and forestry machinery. Later, with the inclusion of his childrens, was created in 1995 Tallers Gon-Gar, S.L, where they joined other services such as electricity and maintenance of all types of machinery, agricultural and industrial, hydraulic, pneumatic and jobs size with the turn and spawning. Over 40 years of experience in agricultural machinery, where you will find solutions and advice on buying, both hobby machinery, such as professional or semi-professional.